As you know, I love experimenting with different types of food. I’m a sucker for all things Korean like bibimbap as well as Thai food like curry patties. I even love a great banh mi sandwich if I ever get the chance to have one at a food truck park. The Kid however is more of a burger and fries, plain vanilla, don’t mess with my food and make it weird person. Sigh, apparently my apple was thrown totally into another orchard entirely. (LOL, that ole apple doesn’t fall far from the tree reference there.) Last night she wanted hot dogs. I wanted excitement. Being the great family we are, we compromised and had both. I banh-ed my dog. Yes, I made her hot dog normal and made mine banh mi style with the cucumbers, carrots, spicy sauce just like a banh mi sandwich! Both of us ended up very happy. Her with plain ketchup dog, and me with excitement dog. Which dog are you? Grill your hot dogs as usual and toast your buns if desired. Thinly slice or shred the raw carrot, and slice or julienne cut your cucumber. In a small bowl, mix the mayonnaise and sriracha. In another small bowl, mix the PB2 with water to make a thin consistency. 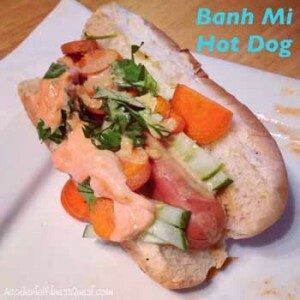 Spread 1/4 of the sriracha mayo on each bun and place a hot dog inside. Top each with the carrot and cucumber. Drizzle with the PB2 and top with the cilantro for garnish. Serve each hot dog with a lime slice for squeezing on top. Makes 4 servings at approximately 268 calories – 16g protein, 24g carbs, and 12g fat. I used regular white hot dog buns and turkey hot dogs so the dogs were lower in fat and calories than regular hot dogs. You could use a baguette if you prefer a more traditional banh mi sandwich style and also a regular hot dog or even a veggie dog. By using PB2, I was able to keep the calories way down here. You could also sprinkle on chopped peanuts instead or use real peanut butter.